Since 1995 Fogmaker International AB has been developing, manufacturing and marketing fire suppression systems for engine compartments with high pressure water mist. Our fire suppression system has an unique extinguishing performance as it both cools down and smothers the fire, at the same time as the foam additive effectively prevent the fire from reigniting. It all started in Växjö in the southern part of Sweden when a need emerged for a fire suppression system in rally cars with a situation independent container. The inventor, Mr Kennerth Samuelsson, registered the Fogmaker name in 1995. Yet, it wasn’t until 2004 when Fogmaker entered the bus market that the business started growing. We are proud of the trust our customers around the world have shown us. Fogmaker’s fire suppression system first saw the light of day in 1995. Today, more than 173,000 vehicles are equipped with Fogmaker’s high-pressure water mist systems in more than 50 countries. In 2018 Fogmaker's R&D Training Academy stood ready and is built in close connection to the head office. This building is a test center for research and development. Here we also do training and education for customers and partners worldwide. At our Training Academy partners will be trained and certified for doing service/installations on the Fogmaker system. EXPERTISE – We have a high level of expertise that we are constantly developing and improving. COMMITMENT – We are commited to our business operations, our customers and to society. 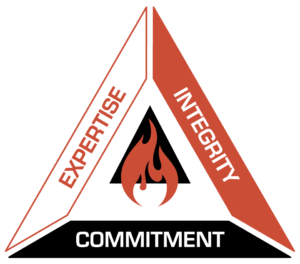 INTEGRITY – We are honest and trustworthy in all our business operations. We are the first fire suppression system to pass the ­official tests and receive the certificate for UNECE Regulation 107. Fogmaker International AB develops, manufactures, install and perform service for automated fire suppression systems in engine compartments and other closed areas. Customers are found world wide and consist of both OEM customers and local operators. Our business idea is: To offer the market efficient and environmental friendly fire suppression system for engine compartments and closed areas. To be a successful organization we work with a process perspective with clear goals and action plans connected to all head processes within Fogmaker. To succeed with our stated goals we must understand and live up to the demands from our customers, legal requirements from authorities and other stakeholders. This requires committed co-workers, who understand how important these demands affect them in their areas of responsibility. It also includes co-workers who continuously work with internal improvements. Tend to and develop national and international business relationships with customers and local operators. Meet branch of industries in constant alteration through innovations and cost-efficient product processing. Create a process-oriented and high efficient manufacturing chain. Guarantee good quality on product and processes through certifications required by prevailing quality management systems and product certifications. Be an attractive work place who develops their co-workers and attract new qualified workers. Generate profitability through everything we do with focus on long term and cost consciousness. Continuously strive to reduce any negative environmental impact, both regarding our surrounding and product, through an active life cycle perspective. This policy shall be reviewed and verified annually.